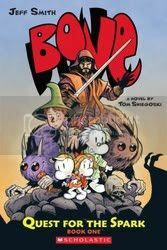 Bone: Quest for the Spark, Book 1 is a great followup to the Bone series. Thorn is queen and there has been peace in the Valley since the events of Bone. However, that is until people in the village start falling asleep and never waking up, including Queen Thorn. Enter 12-year-old Tom Elm, turnip farmer. There isn't much about Tom that is extraordinary, except for his belief that he is destined for something greater. The destiny becomes apparent when the Dreaming chooses Tom to be their champion against the Nacht, the evil that is corrupting the Waking World. Tom it directed by the Dreaming to bring together a band of heroes to help him in defeating the Nacht. Book 1 of Quest for the Spark is your general introductory trilogy book; we meet the main cast of characters, both good and bad, and are introduced to the danger at hand. Not much else happens here, but it is a great addition to the Bone mythology. It's different from previous Bone stories in that it is a prose story, but it it illustrated in full color throughout by Jeff Smith (the creator of Bone) and the illustrations are fantastic. I've always been a fan of Jeff Smith's artistic style; it's very simplistic and minimal but he packs quite a bit of emotion into each art panel. I prefer to see his artwork in black and white (as it was originally presented) but the colored version of these illustrations are still gorgeous. Tom Sniegoski does a great job in keeping the light and whimsical yet serious and epic feel of Smith's writing from the original series. Overall, a great book and I can't wait for the next volume!